Usually when you need some extra heat, it is because you are in a cold remote area. Sometimes there is power nearby, but if their isn't, your forced air heater is pretty useless. 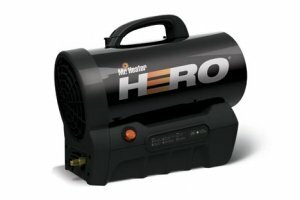 Mr. Heater wants you to have a truly portable forced air heater, and has accomplished it with their HERO model. HERO delivers 35,000 BTU's of propane burning heat and can be used an entire workday (8 hours) on a single charge of its built in battery. While the battery does make the unit more portable, it can also be charged and run off of the power adapter at the same time. Using a 20 lb tank of propane, the HERO can be run for a total of 12 hours, can heat up to 800 square feet of space, and remains cool to the touch on the outside. Besides being portable, Mr Heater also designed the HERO to be quieter than other heaters on the market. Their Quiet Burner Technology claims to be half as loud as traditional forced air heaters. I would say the only downside I can see is the long 5.5 hour charge time. The MH35CLP HERO heater retails for about $170, and includes a 10-foot hose and regulator. If you have this model or plan on getting one, let us know how it works out.